Customers outside the United States are responsible for all shipping and handling charges including but not limited to duties, import or export fees, etc. 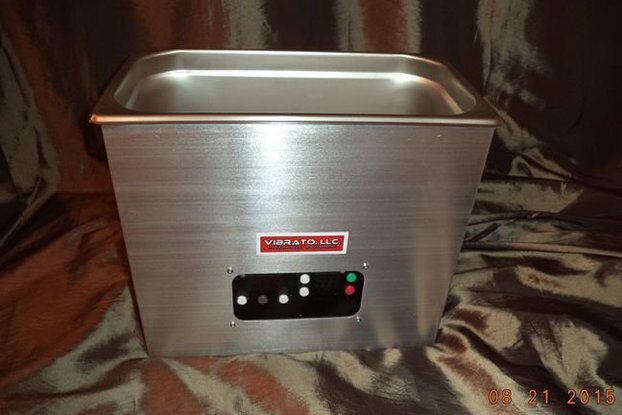 I recently purchased Vibrato LLC's 60KHz 6 quart Ultrasonic Cleaner, and I couldn't be happier. Great customer service, outstanding craftsmanship, and the highest quality (and quietest) Ultrasonic Cleaner on the market have my records sounding better than new. I highly recommend considering Vibrato LLC in your search for an Ultrasonic Cleaner. Thank you for the kind words and review! very good at communicating any or all issues and has my deepest respect as a man of integrity and honesty. If you want a record cleaner that does the trick vibrato is the place to go. Thank you for the kind words and recommendation! Reviews from customers is always appreciated! Thank you for taking the time to share your experience! Have not really tested for a long period. Still setting up a space for Vinyl Record Cleaning. Here is what is amazing. Cleaning thirty and forty year old albums that come out looking and sounding brand new! Lewis, the maker of the Vibrato, is an excellent communicator, helpful, and a real stand up guy. He backs his products without question and is a person willing to do the right thing. Lewis packs his shipments with care but my first order with Lewis was destroyed by UPS rough handling. I emailed the situation to Lewis and in no time he offered a refund or new unit. He shipped the replacement unit in no time. I've paired the Ultrasonic cleaner with the Vinyl Stack record holding system and Turgiclean cleaning concentrate. The results have been better than I expected. Much better! My albums are now dead quiet. After cleaning fifty or so albums I was confident enough to clean Mark Knofler's ShangriLa album, a favorite and rather rare album with the Vibrato LLC unit. Excellent results. Here are some hints: Warm Distilled water is helpful. I start with pre heated water, not more than 40 C (104 F). Mix in Turgiclean prior to dipping in your vinyl. If you use the Vinyl Stack it includes lintfree micro fiber cloth. Get extras as Vinyl Stack's cloths are the best I've found for drying, and I've tried several brands. 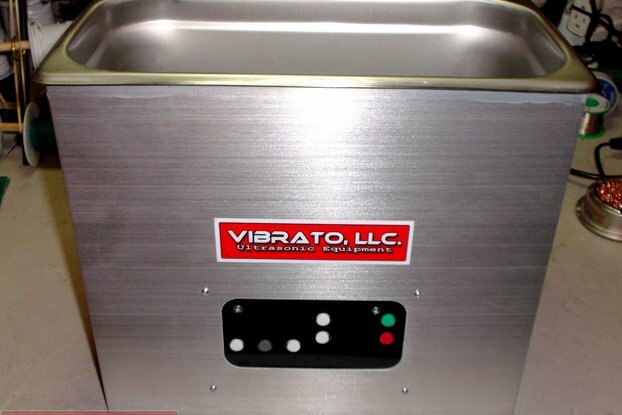 Read and follow the information provided with your Vibrato, LLC ultrasonic cleaner. In conclusion, in buying this you will have the best record cleaning system available, the main component of which you can count on both the Ultrasonic cleaner and its manufacturer, Lewis Steele. Many, many thanks Lewis for making such a great thing available and affordable for us vinyl enthusiasts, I am a delighted customer. P.S. I'm a different Scott from the other reviewer named Scott. Thank you, "Different" Scott ! I am glad everything worked out great in the end! Thanks for sharing your cleaning procedure, too. I've heard good things about the "TergiKleen" and the Vinyl Stack. There are several utltrsonic cleaners on the market for use for cleaning records,cd, and other items. Many of these are more expensive than this product because of cosmetic finish and all in one operation facility i.e. they have included mechanisms to rotate and support the materials to be cleaned and the more expensive models have incorporated drying facilities. The disadvantage with the more expensive models, apart from price, is that : usually varying cycle parameters such as time and temperature is more restrictive, items other than records cannot be cleaned easily as their apertures are designed for records only, and they discourage the use of bespoke cleaning solutions on the ground that this has alrady been optimised and warranty issues. The disadvantage of the Vibrato is that it has more industrial appearance, although the finish is good and not unattractive, and mechanisms for drying and support of media have to be considered. Many , as have I, use the vinyl stack (vinylstack.com), which works extremely well and allows for further customisation as its height and speed of rotation can be varied and it allows for simulataneous cleaning of three records at a time. There is much debate on the exact frequency and power and how the ultrsonic excitation is applied for record cleaning. The Vibratio is made by a company that seems to be aware of the pro and cons of power, frequency, number of transducers and problems of tuning and standing wave formation which suggests that the manufacture understands ultransonic cleaning and I have not seen the issue of output frequency tuning or standing wave formation addressed in the literature of other manufacturers. My experience with this unit after several months cleaning both records and cds has been very positive. My experience hitherto had been limited to various cleaning sloutions and the use of a Lorricraft (Keith Monk's inspired) vacuum cleaning machine. I cannot compare the results of this machine to 60khz models or other maufactures but the results I have experienced subjectively are as others have described: lower noise, a sense of greater ease and fluidity, more low level detail retrieval, and more sense of space and three dimensionality. I believe the results are better than vacuuming and as another reviewer has found. comparing the Audio Desk, KLAudio and vacuum record leaning machine, that a two stage process works best -ultrasonic cleaning and then vauum cleaning/drying, preferably with a vaccum machine that has a Keith Monks type mechanism. The results clearly indicate what at the end of the process is contamination and what is irreperable damage both visually and audibly. Whist I have access to an electronmicroscope and I have not visually inspected pre an post cleaned records with a scanning electronmicroscope, I do have what would be considered a high end system and I do set up my cartriges with spetrum analyzers using CBS str 112 test tracks and I asses the results in an acoustically treated and measured room and using Stax electrostatic headphones. Cleaning with this machine will not tranform your records or system but will provide very worthwhile benefits the level of which I found pleasantly suprising. In particular the sense of increased fluidity ease and poise was unexpected and I had not achieved through the playing of records by altering cartridges, tonearms, record players etc. The maufacturer was helpful with questions and dispatched promptly and the unit has been reliable. As the maufacturer seems to have developed a product for audiophiles, which I conjecture is due to expertise gained in comercial or possibly the defense industry, I would like to see this sort of iniative supported. I therefore recommend this product and urge anyone considering ultrosinic cleaning to considedr this machine. Thank you so much for a very informative and thorough review, which I am sure will help other vinyl audio enthusiasts, whether or not they buy an ultrasonic cleaner from us. I deeply appreciate the time you took to review our product!